(1) The clinical presentations and sources of ischemic stroke. (2) Thrombolysis in acute ischemic stroke. (4) The workup of ischemic stroke. (5) Secondary ischemic stroke prevention. Ragged-red fibers in a patient with mitochondrial encephalopathy, lactic acidosis, and stroke-like episodes (MELAS). An ischemic stroke refers to the death of neurons within the brain as a result of a disturbance in blood supply. The diversity of potential sites and sources involved in ischemic stroke is tremendous. The ischemic stroke site (where in the brain the stroke occurs) can usually be determined clinically, or at least narrowed down considerably - for example, cortical signs such as hemianopia, aphasia, and neglect indicate that the cerebral cortex is involved. Sometimes it is more useful to define the site by the vascular territory that supplies the affected part of the brain (as in a left middle cerebral artery stroke), and sometimes it is more useful to define it by the affected part of the brain itself (as in a lateral medullary stroke). Ischemic stroke presents in many forms. - These strokes involve the cerebral cortex and can often be identified by the presence of cortical signs, such as homonymous hemianopia (visual loss to either side of the midline), expressive or receptive aphasia (deficiency of the ability to produce or comprehend spoken or written language), and hemispatial neglect (deficiency of awareness of one side of the body). - By convention, cortical strokes are usually classified by the occluded artery into anterior, middle, and posterior cerebral artery strokes. - These strokes represent roughly 5% of all ischemic strokes (Ng et al, 2007). - Patients present with contralateral weakness and sensory deficiency affecting mainly the leg, urinary incontinence, and anosmia (deficiency in the ability to perceive smell). - These strokes are the most common of all ischemic strokes, representing roughly 50-70% of all ischemic strokes (Ng et al, 2007). - Patients present with contralateral weakness and sensory deficiency affecting the lower half of the face and the entire arm (the so-called brachiofacial pattern of weakness), and to a lesser extent the leg, as well as a contralateral homonymous hemianopia. - Left middle cerebral artery strokes may also present with expressive or receptive aphasia. One useful constellation of symptoms that usually readily identifies damage to the left inferior parietal lobe includes agraphia (deficiency in the ability to write), acalculia (deficiency in the ability to comprehend math), left-right disorientation, and finger agnosia (deficiency in the ability to distinguish fingers on the hand); this is known as Gertmann's syndrome. - Right middle cerebral artery strokes may also present with contralateral hemispatial neglect (failure to attend to space or use the limbs), extinction (failure to perceive a visual or tactile stimulus applied bilaterally, though it can be perceived when applied unilaterally), astereognosis (inability to identify an object by touch in the hand), agraphesthesia (inability to identify a number written on the hand), agnosia (unawareness of a neurological deficit) and apraxia (inability to perform previously learned tasks despite intact sensory and motor function). - The above cortical signs may occasionally be produced by the other hemisphere. - These strokes represent 5-10% of all ischemic strokes (Ng et al, 2007). - Patients present with contralateral homonymous hemianopia. They can, however, present with a wide variety of additional deficits, including cortical blindness (loss of vision with no damage to the eyes, although blindsight remains), visual agnosia (deficiency in the recognition of visually presented objects), and prosopagnosia (deficiency in the ability to recognize faces). - Named after the latin word lacune (meaning "empty space"), these strokes represent 13-25% of all ischemic strokes (Ng et al, 2007; Sacco et al, 2006). - They result from the occlusion of a deep penetrating artery branching off of one of the larger arteries, probably by microatheroma, and largely affect the cerebral white matter (corona radiata or internal capsule), thalamus, basal nuclei, or brainstem. - Patients present with a classic lacunar syndrome which is either pure motor (weakness on one side), ataxic hemiparesis (weakness and ataxia on one side), dysarthria/clumsy hand (dysarthria and ataxia in the hand), pure sensory (numbness, tingling, or pain on one side), or sensorimotor (weakness and sensory deficit on one side). - Notably, there are no cortical signs. - These strokes represent 2-4% of all ischemic strokes (Nelson et al, 2009; Ng et al, 2007). - Patients present with vertigo (an innappropriate experience of the perception of motion), ipsilateral ataxia, headache, and nausea. - It is imperative to look for physical signs in patients with these strokes, as CT scans are only 26% sensitive for acute cerebellar ischemic stroke (Chalela et al, 2007). If vertigo is the only symptom, check for direction-changing nystagmus (56% sensitive), a negative head impulse test (found in over 90% of patients with cerebellar stroke), and an inability to walk without support (found in 71% of patients with cerebellar stroke) (Nelson et al, 2009). - As a result of the central position of the thalamus within the brain, patients with these strokes can present with virtually anything, including cortical signs. - There are four different thalamic vascular syndromes, based upon the arteries affected and clinical presentation, including tuberothalamic (deficiencies in wakefulness, learning and memory, executive function, and personality), paramedian (deficiencies in wakefulness, learning and memory, and executive function), inferolateral (contralateral weakness and pain), and posterior choroidal (weakness, sensory deficiency, visual field loss, dystonia, and tremor) artery strokes (Schmahmann, 2003). - Remember the rule of 4 - midline (motor nucleus, motor pathway, MLF, medial lemniscus) and side (spinothalamic pathway, sensory nucleus of CN5, sympathetic pathway, spinocerebellar pathway). - Patients with medial midbrain strokes can produce contralateral ataxia as the red nucleus receives a crossed projection from the cerebellum. - There are two major medullary syndromes, lateral (Wallenberg syndrome) and medial (Dejerine syndrome). - Patients with lateral medullary strokes present with any combination of ipsilateral Horner's syndrome, ipsilateral ataxia, and crossed pain and temperature loss involving the ipsilateral face and contralateral body. - Patients with medial medullary strokes present with ipsilateral tongue deviation, contralateral weakness, and contralateral proprioception and vibration loss. Since the the ischemic stroke source dictates the treatment, it is the core of the diagnosis. Several different schemes have been created to classify the stroke source, including the Trial of Org 10172 in Acute Stroke Treatment (TOAST) criteria which classifies ischemic strokes by etiology (Adams et al, 1993). The etiologies include large artery atherosclerosis (ruptured plaque with at least 50% stenosis in a major artery), cardioembolism (such as atrial fibrillation, wall dyskinesia, left ventricle thrombus, and dilated cardiomyopathy), small-vessel occlusion (microatheroma occluding the penetrating arteries that supply deeper brain structures), other determined etiology (such as arterial dissection, clotting abnormalities, vasculitis, migraine, and MELAS), and undetermined etiology (no source found). Regarding numbers 50% of ischemic strokes are cardioembolic, 25% are large artery atherosclerosis, and 10% are small-vessel occlusion. Thrombolysis, sometimes called "clot busting," refers to the breakdown of blood clots by administering a medication that stimulates plasmin (an enzyme that degrades clots). The medications that do this are tissue plasminogen activator (an enzyme that converts plasminogen into its active form, plasmin) analogs. The older tissue plasminogen activators are streptokinase and urokinase and the newer ones are alteplase and tenecteplase. There is ongoing debate in the literature as to whether thrombolysis in acute stroke is beneficial or not. A large meta-analysis in 2012 involving twelve trials and 7012 patients determined that tissue plasminogen activator administered 0-6 hours after an ischemic stroke onset conferred a significant net benefit with regards to survival and independence (Wardlaw et al, 2012). However, a rebuttal in 2013 by the independent NNT group determined that a meta-analysis was inappropriate and that viewed separately, only two of the twelve studies actually conferred benefit, with the remainder conferring no benefit or even harm (The NNT, 2013). Who to believe? The only way to discover the truth in a situation like this is to do a bit of research. After doing so, it became apparent to me that both groups are guilty of playing up their arguments by emphasizing those results that support them more, and downplaying the results that do not. I decided to view each study independently, as the NNT group did, and made several conclusions. First, several of the twelve trials are irrelevant to the question at hand, which is whether or not thrombolysis with alteplase improves long-term outcomes in acute stroke. MAST-Italy, MAST-Europe, and ASK all used streptokinase - they are to be discounted. Second, I wanted to look at the evidence for alteplase thrombolysis within the 0-4.5 hour window, leaving out the 4.5-6 hour question for the moment. This excluded several more trials leaving only NINDS-1 (<3 hours), NINDS-2 (<3 hours), and ECASS-III (3-4.5 hours). In NINDS-1, thrombolysis resulted in no significant difference in neurological outcomes at 24 hours. However, longer-term follow-up in NINDS-2 showed that thrombolysis resulted in a significant 12% absolute (32% relative) increase in the number of patients with minimal or no disability by three months, making the NINDS-I result irrelevant. In ECASS-III, thrombolysis resulted in a significant 7.2% absolute (13.7% relative) increase in the number of patients with minimal or no disability by three months. Third, I looked at the evidence for alteplase thrombolysis within 0-6 hours. The relevant trials were ECASS (0-6 hours), ECASS-II (20% of the patients were 0-3 hours, so essentially 3-6 hours), ATLANTIS-B (3-5 hours), ATLANTIS-A (15% of patients were 0-3 hours, so essentially 3-6 hours), and IST-III (0-6 hours). In ECASS, thrombolysis resulted in some benefits in functional outcomes for a defined group of patients, but it was concluded that these patients would be hard to identify prior to thrombolysis. In ECASS-II and ATLANTIS-B, thrombolysis resulted in no benefit at three months. In ATLANTIS-A, thrombolysis resulted in slight harm at three months. Finally, in IST-III, the largest and most recent of the trials, thrombolysis resulted in no clear benefit at six months, although the data showed improved outcomes with thrombolysis administered 0-3 hours after stroke onset (and half of the patients were over 80 years old). My own conclusion, after viewing each study independently as the NNT group did, is as follows. First, alteplase thrombolysis administered 0-3 hours after ischemic stroke onset results in an improved long-term functional outcome. This is strongly supported by NINDS-2, ECASS-III, and IST-III. Second, alteplase thrombolysis administered 3-4.5 hours after stroke onset also results in an improved functional outcome. This is strongly supported by ECASS-III. Third, there is not enough evidence of benefit to support alteplase thrombolysis administered 4.5-6 hours after stroke onset. However, there is also no clear evidence of any harm, with only one of five trials - ATLANTIS-A - showing evidence of slight harm. Thus, the weight of the evidence, viewing each study independently, favours thrombolysis administered within 4.5 hours after stroke onset. There is no significant evidence of benefit or harm for 4.5-6 hours. However, those who still oppose thrombolysis in this time-frame are often failing to consider the devastation wrought by a stroke - many of the people with strokes who may be eligible for thrombolysis after 4.5 hours will become dependent or die if nothing is done, and thrombolysis may be their only chance of avoiding a dismal outcome. The rate of intracerebral hemorrhage does show an absolute increase of 2-3% within the first week, but this is more than offset by the long-term increase in independent recovery. With that out of the way, successful thrombolysis ought to proceed as follows. - Take a history as usual - call a family member if necessary - but do it concisely and quickly. - It is essential to know about premorbid status (must be reasonably independent), time of onset (must be within 4.5 hours), and headache (suggests subarachnoid hemorrhage), as well as history regarding intracranial pathology, advanced liver disease, and anticoagulation status. - It is important to know about any recent trauma, surgery, bleeding, cancer, stroke, or myocardial infarction. - Note the blood pressure (this cannot be greater than 180 mmHg systolic or 110 mmHg diastolic, but it can be managed later) and blood glucose (this cannot be less than 3 mmol/L or greater than 22 mmol/L). - Assess the National Institutes of Health Stroke Scale (NIHSS) score, a 15-item neurological examination stroke scale (Brott et al, 1989). Although many hospitals still use the NIHSS, many may use the modified NIHSS, designed to get rid of poorly reliable items, namely level of consciousness, facial paresis, limb ataxia, and dysarthria (Meyer et al, 2009). The NIHSS score should be at least 4 before proceeding. - Organize the scan right away. - During this time, get the ECG and bloods (full blood count, electrolytes, coagulation studies, and group and hold). If there is a history of diabetes or renal failure, check the creatinine prior to any angiography unless the latter cannot be delayed for any reason. - If the CT shows no bleed, get a CTA (and CTP if the hospital performs them). Rule out hypodensity and blurring of the grey-white junction (the presence of either of these indicates that the stroke has progressed to the point that thrombolysis may result in symptomatic hemorrhage. - Once the scan is done, it may be essential to obtain the platelet count (if there is a known platelet disorder; this cannot be less than 100,000 uL), APTT (if there is a known coagulation disorder or any heparin given in the last 48 hours; this cannot be greater than normal), and INR (if there is a history of advanced liver disease or the patient is on anticoagulation; this cannot be greater than 1.5). - Discuss the option of thrombolysis with the patient and their family. Outline the potential benefits and risks. The risks are intracerebral hemorrhage (6-7%) (Hacke et al, 2004; Wardlaw et al, 2012); systemic bleeding (depends on patient), and angioedema and anaphylaxis (1-5%) (Engelter et al, 2005). - If the blood pressure is greater than 180 mmHg systolic or 110 mmHg diastolic, it must be acutely lowered. Hydralazine 5 mg iv over one minute (repeat 5-20 mg iv every five minutes until adequate, then either 20 to 60 mg six hourly or 10 to 30 mg iv six hourly). Labetalol 10 mg iv over one minute (repeat 10 mg iv in five minutes, then 10-20 mg iv every five minutes until adequate, then 20-40 mg iv four hourly). Metoprolol 5 mg iv (repeat 5 mg iv every five minutes until adequate, then 5 to 10 mg iv four hourly). - Once the blood pressure is lowered, administer thrombolysis by patient weight. Alteplase 0.9 mg/kg iv (give 10% as a bolus, then the remaining 90% added to 50 ml 0.9% NaCl over over one hour). - Intracerebral hemorrhage often presents with any combination of headache, nausea, vomiting, acute neurological deterioration, or acute rise in blood pressure. If hemorrhage confirmed, give prothrombinex 50 units/kg iv over twenty minutes (most essential), fresh frozen plasma 2 units iv, and vitamin K 10 mg iv over ten minutes (if warfarin involved). Consult neurosurgery on a case by case basis. - Angioedema often presents with peri-oral or tongue swelling. Give high-flow oxygen with a salbutamol nebulizer. Give promethazine 25 mg iv, ranitidine 50 mg iv, and hydrocortisone 100 mg iv. Call anesthetics early for a possible intubation. If severe anaphylaxis occurs with symptomatic hypotension, give 1:1000 adrenaline 0.5 ml im (only if necessary as this will induce hypertension). Decompressive hemicraniectomy involves temporary removal of a large part of the skull and allows edematous tissues from malignant MCA strokes to expand outside of the skull vault. Typically there is some disability after this procedure, measured by the Modified Rankin Scale (mRS) from 0 to 6 as follows. 1 No disability, mild symptoms but can carry out all affairs and usual activities unassisted. 2 Slight disability, can carry out affairs but not all usual activities. 3 Moderate disability, cannot carry out all affairs and activities but can walk unassisted. 4 Moderately severe disability, unable to attend bodily needs or walk unassisted. 5 Severe disability, bedridden and requires constant care. In young patients under 60 years of age hemicraniectomy can be beneficial (Vahedi et al, 2007). Regarding mortality, hemicraniectomy within 48 hours of the ischemic stroke increases one-year survival from 29% to 78%. Regarding disability, 43% of hemicraniectomy patients compared to 21% of conservative patients have a good outcome (mRS 3 or less), and 75% of hemicraniectomy patients compared to 24% of conservative patients have a borderline outcome (mRS 4 or less). Ischemic stroke in young people can have particularly disastrous consequences for the individual and society (Phillips et al, 2011). Thus, the search for the stroke source must be exceedingly thorough. CT/A head and neck (may need MRI brain). FBC, electrolytes, Cr, LFTs, coags, fasting blood sugars and lipids, and urinalysis. Cardiac tests (ECG, telemetry/Holter, and TTE/TOE). TOE with bubble study and views of the aortic arch, and consider bilateral lower limb US for DVTs. Thrombophilic screen (factor V Leiden, prothrombin G2021A, AT-III, protein C and S, lupus anticoagulant. Igs, serum protein electrophoresis). Antiphospholipid screen (anti-phospholipid antibodies, anti-cardiolipin antibodies). Infectious screen (HIV, Hep B antigen and antibody, Hep C antigen, cryoglobulins, blood cultures, and blood film). Metabolic screen (homocysteine, lactate, muscle biopsy, and alpha-galactosidase). Connective tissue disease screen (CTA chest/abdo/pelvis, alpha-1 antitrypsin, and COL3A1 gene). Eagle's screen (CT skull base and neck). ​Sickle cell preparation (if African descent). Once the ischemic stroke source has been (hopefully) found, the next step in treatment is to prevent the occurrence of any further ischemic strokes. There are a few different types of treatments available. - The International Stroke Trial showed that aspirin reduces the absolute risk of stroke recurrence within 14 days from 3.9% to 2.8%, for an absolute risk reduction of 1.1% and a relative risk reduction of 28%, compared to placebo, with no significant increase in hemorrhagic strokes (International Stroke Trial Collaborative Group, 1997). - The use of clopidogrel has been shown to be as effective as aspirin in comparative studies (Antithrombotic Trialists Collaboration, 2002). - The use of aspirin plus clopidogrel has been looked at by the MATCH study, a large, high-quality trial (Diener et al, 2004). A non-significant reduction in major vascular events was shown, and the absolute risk of major bleeding increased from 0.6% to 1.9% for an absolute risk increase of 1.3%. However, the CHANCE trial, another good study (Wang et al, 2013) showed that aspirin plus clopidogrel given within 24 hours of symptom onset was superior to aspirin alone for reducing the risk of stroke in the first 90 days, and did not increase the risk of hemorrhage. - Statins are the only cholesterol-altering medication that have any impact on stroke incidence. Perhaps surprisingly, however, no clear relationship has ever been demonstrated between stroke risk and dyslipidemia (Prospective Studies Collaboration, 1995). Thus, although statins do alter cholesterol levels, their ability to reduce the risk of ischemic stroke is through another mechanism. - The ASCOT trial showed that a low dose of atorvastatin reduces the absolute risk of stroke after only one year from 1.34% to 0.86%, for an absolute risk reduction of about 0.5% and a relative risk reduction of 36% compared to placebo (Sever et al, 2003). - Acute blood pressure lowering does not improve disability or mortality (He et al, 2013). In fact, acute hypertension following an ischemic stroke should be permitted up to 220 mmHg systolic or 120 mmHg diastolic, and lowered by not more than 15% over 24 hours (Jain et al, 2009). - However in the longer term, the relationship between blood pressure and first stroke risk is direct, continuous, and independent above 115/75 mmHg, thus hypertension should be treated in primary as well as secondary ischemic stroke prevention (Ravenni et al, 2011). The systolic blood pressure is more important: the lower the systolic blood pressure, the lower the risk of stroke (Staessen et al, 2000). - The antihypertensives that reduce ischemic stroke risk compared to placebo or no treatment are: angiotensin-converting enzyme inhibitors (perindopril, lisinopril), angiotensin II receptor blockers (losartan, candesartan), dihydropyridine calcium channel blockers (amlodipine, nifedipine), and thiazide diuretics (hydrochlorothiazide) (Ravenni et al, 2011). The HOPE study showed that ramipril reduces the absolute risk of stroke after four and a half years from 4.9% to 3.4%, for an absolute risk reduction of 1.5% and a relative risk reduction of 32%, compared to placebo (Bosch et al, 2002). - Anticoagulation is indicated in several situations. The most common by far is atrial fibrillation. (a) Primary and secondary stroke prevention in atrial fibrillation (all anticoagulants). - Generally, patients with atrial fibrillation have an ischemic stroke risk of 4.5% per year, which treatment with warfarin reduces to 1.4%, for an absolute risk reduction of 3.1% and a relative risk reduction of 70% (Barnes et al, 2013). The indication for anticoagulation in non-rheumatic atrial fibrillation depends on the risk factors present as assessed by the CHADS2 score. Moreover, warfarin substantially reduces the risk of any embolic event (ischemic stroke, transient ischemic attack, or peripheral embolism) in patients with atrial fibrillation compared to patients without anticoagulation (Ruiz et al, 2010). - Importantly, warfarin is not the only anticoagulant out there now. - The RE-LY study showed that dabigatran is also useful. The lower dose was as effective as warfarin in preventing ischemic stroke and the higher dose was more effective (Connolly et al, 2009). - A systematic review including two more novel anticoagulants, rivaroxaban and apixaban, showed that these newer drugs are as effective as warfarin in preventing ischemic stroke (Adam et al, 2012). Can be reversed with idarucizumab (activated thrombin time should be >150, then give 5 g in 100 ml iv, and discuss with hematology first). 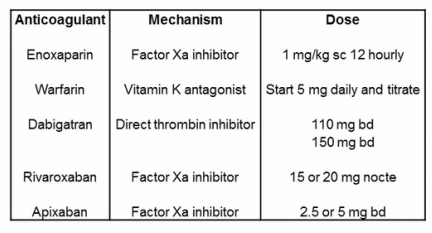 - Lower doses of novel anticoagulants are indicated for patients >75 years of age or with renal failure (GFR >60 use higher dose, GFR 30-60 use lower dose, GFR <30 consider warfarin instead). (b) Remaining situations (heparin and warfarin only). - Anticoagulation can be indicated for other reasons too (the target INR is 2-3 unless noted otherwise). - The indications for carotid endarterectomy depend upon whether a carotid artery stenosis is symptomatic or asymptomatic. - For symptomatic (transient ischemia or stroke) patients, the NASCET and ECST trials found that carotid endarterectomy confers a strong benefit for patients with a symptomatic stenosis of 70-99%, and a moderate benefit for patients with a symptomatic stenosis of 50-69% (Ferguson et al, 1999; Rothwell, 2003). Notably, there is almost no benefit for carotid near occlusions. Thus, carotid endarterectomy is recommended for symptomatic stenoses of 50% or greater, with the possible exception of near occlusions. - For asymptomatic patients, the ACST trial found that carotid endarterectomy reduces stroke risk after five years from 11% to 5.1%, for an absolute risk reduction of 5.9% and a relative risk reduction of 53% compared to controls (Executive Committee for the Asymptomatic Carotid Atherosclerosis Study, 1995). Most agree that the annual risk of stroke with asymptomatic carotid artery disease is 1-2%, although some patients with ulcerated plaques are probably at higher risk. Thus, carotid endarterectomy is recommended for asymptomatic stenoses of 70% or greater in patients expected to live at least five years. - Carotid endarterectomies should be done within two weeks of the stroke. Here is a synopsis of ischemic stroke treatment. Thrombolysis for acute ischemic stroke if within 4.5 hours (if not, give aspirin or clopidogrel 300 mg). Consider hemicraniectomy in patients under 60 years of age. Fast and provide venous thromboembolism prophylaxis (enoxaparin 20 or 40 mg sc daily) in patients at risk. Commence antiplatelet (aspirin 100 mg daily or clopidogrel 75 mg daily). Commence statin (atorvastatin 10-80 mg nocte or rosuvastatin 10-40 mg nocte). Commence or increase antihypertensives after two days (any class combination of perindopril 2-16 mg daily, lisinopril 5-80 mg daily, losartan 50-100 mg daily, candesartan 4-32 mg daily, amlodipine 2.5-10 mg daily, long-acting nifedipine 20-60 mg daily, or hydrochlorothiazide 12.5-25 mg daily). Commence anticoagulation within one week if indicated (consider cardiac ablation for atrial fibrillation in a young stroke). Perform carotid endarterectomy within two weeks if indicated. Treat depression with citalopram 20-40 mg daily. Ischemic stroke no longer has to be passively managed. Thrombolysis offers a chance at stopping it dead in its tracks, and any objective review of the evidence shows that it works. It is necessary to give a stroke patient every opportunity to recover, and thrombolysis is often the only chance to really make a difference in outcome. The short-term increased risk of symptomatic intracerebral hemorrhage is a worthy trade-off for the long-term reduction in disability and dependence. Once an ischemic stroke is completed, secondary prevention strategies are all about preventing the next stroke. Adams et al. 1993. Classification of subtype of acute ischemic stroke. Definitions for use in a multicenter clinical trial. TOAST. Trial of Org 10172 in Acute Stroke Treatment. Stroke 24, 35-41. Adam et al. 2012. Comparative effectiveness of warfarin and new oral anticoagulants for the management of atrial fibrillation and venous thromboembolism: a systematic review. Annals of Internal Medicine 157(11), 796-807. Antithrombotic Trialists Collaboration. 2002. Collaborative meta-analysis of randomised trials of antiplatelet therapy for prevention of death, myocardial infarction, and stroke in high risk patients. British Medical Journal 324(7329), 71-86. Barnes et al. 2013. Warfarin use in atrial fibrillation patients at low risk for stroke:analysis of the Michigan Anticoagulation Quality Improvement Initiative (MAQI2). Journal of Thrombosis and Thrombolysis 37(2), 171-176. Bosch et al. 2002. Heart outcomes prevention study: double blind randomised trial. British Medical Journal 324, 699-702. Brott et al. 1989. Measurements of acute cerebral infarction: a clinical examination scale. Stroke 20(7), 864-870. Chalela et al. 2007. Magnetic resonance imaging and computed tomography in emergency assessment of patients with suspected acute stroke: a prospective comparison. Lancet 369, 293-298. Connolly et al. 2009. Dabigatran versus warfarin in patients with atrial fibrillation. New England Journal of Medicine 361, 1139-1151. Diener et al. 2004. Aspirin and clopidogrel compared with clopidogrel alone after recent ischaemic stroke or transient ischaemic attack in high-risk patients (MATCH): randomised, double-blind, placebo-controlled trial. Lancet 364(9431), 331-337. Engelter et al. 2005. Life-threatening orolingual angioedema during thrombolysis in acute ischemic stroke. Journal of Neurology 252(10), 1167-1170. Executive Committee for the Asymptomatic Carotid Atherosclerosis Study. 1995. Endarterectomy for asymptomatic carotid artery stenosis. The Journal of the American Medical Association 273(18), 1421-1428. Ferguson et al. 1999. The North American symptomatic carotid endarterectomy trial. Stroke 30, 1751-1758. Hacke et al. 2004. Association of outcome with early stroke treatment: pooled analysis of ATLANTIS, ECASS, and NINDS rtPA stroke trials. Lancet 363(9411), 768-774. He et al. 2013. Effects of immediate blood pressure reduction on death and major disability in patients with acute ischemic stroke: the CATIS randomized clinical trial. The Journal of the American Medical Association 311(5), 479-489.
International Stroke Trial Collaborative Group. 1997. The International Stroke Trial (IST): a randomised trial of aspirin, subcutaneous heparin, both, or neither among 19435 patients with acute ischaemic stroke. Lancet 349(9065), 1569-1581. Jain et al. 2009. Treatment of hypertension in acute ischemic stroke. Current Treatment Options in Neurology 11(2), 120-125. Meyer et al. 2009. The modified national institutes of health stroke scale (mNIHSS): its time has come. International Journal of Stroke 4(4), 267-273. Nelson et al. 2009. The clinical differentiation of cerebellar infarction from common vertigo syndromes. Western Journal of Emergency Medicine 10(4), 273/277. Ng et al. 2007. Comparison of clinical characteristics and functional outcomes of ischemic stroke in different vascular territories. Stroke 38, 2309-2314. Phillips et al. 2011. Ischaemic stroke among young people aged 15 to 50 years in Adelaide, South Australia. The Medical Journal of Australia 195(10), 610-614. Prospective Studies Collaboration. 1995. Cholesterol, diastolic blood pressure, and stroke: 13,000 strokes in 450,000 people in 45 prospective studies. Lancet 346, 1647-1653. Ravenni et al. 2011. Primary stroke prevention and hypertension treatment: which is the first-line strategy? Neurology International 3(2), e12. Rothwell et al. 2003. Reanalysis of the final results of the European Carotid Surgery Trial. Stroke 34(2), 514-523. Ruiz et al. 2010. Oral anticoagulation in nonvalvular atrial fibrillation in clinical practice: impact of CHADS(2) score on outcome. Cardiology 115(3), 200-204. Sacco et al. 2006. A population-based study of the incidence and prognosis of lacunar stroke. Neurology 66(9), 1335-1338. Sever et al. 2003. Prevention of coronary and stroke events with atorvastatin in hypertensive patients who have average or lower-than-average cholesterol concentrations, in the Anglo-Scandinavian Cardiac Outcomes Trial - Lipid Lowering Arm (ASCOT-LLA): a multicentre randomised controlled trial. Lancet 361(9364), 1149-1158. Schmahmann. 2003. Vascular syndromes of the thalamus. Stroke 34, 2264-2278. Staessen et al. 2000. Risks of untreated and treated isolated systolic hypertension in the elderly: meta-analysis of outcome trials. Lancet 355, 865-872. The NNT. 2013. Thrombolytics for acute ischemic stroke. No benefit found. http://www.thennt.com/nnt/thrombolytics-for-stroke/. Vahedi et al. 2007. Early decompressive surgery in malignant infarction of the middle cerebral artery: a pooled analysis of three randomised controlled trials. Lancet Neurology 6(3), 215-222. Wang et al. 2013. Clopidogrel with aspirin in acute minor stroke or transient ischemic attack. New England Journal of Medicine 369(1), 11-18. Wardlaw et al, 2012. Recombinant tissue plasminogen activator for acute ischaemic stroke: an updated systematic review and meta-analysis. Lancet 379(9834), 2364-2372.